A Bit o’Honey … can do so much! The header image of this issue of the blog features a pediatric cardiac surgery being performed in Honduras which benefited from Rotarian humanitarian efforts. Prior to there being a permanent pediatric cardiac unit in San Pedro Sula, Honduras, such critical surgeries had to wait until visiting medical teams, along with equipment and supplies, could be put together to come on a periodic visiting basis to perform such surgeries. A permanent pediatric cardiac surgical ward was created and opened in February 2015 due to many years work on a global grant spearheaded by three Rotary districts, including District 7600, lead by the Innsbrook club and 8 of its sister clubs, the Friends of Barnabas Foundation, the Ruth Paz Foundation , and the The Rotary Foundation World Fund. The grant included a Vocational Training Team to train local health personnel on the equipment provided by the grant. The total grant budget was $112,300, of which $23,000 was donated by the District 7600 clubs. With district and World Fund matching monies and donations for the other partners, this complicated, but magnificent project came to fruition. Three years after a Rotarian donates to the Annual Fund, 50% of that donation comes back to the District to help fund district and global grants. This Innsbrook Rotary-led global grant is only one example of such a global grant. These global grants provide an opportunity for smaller clubs to join in with larger clubs to participate in international (global) projects, which that club might not be financially able to do on its own. Not all grants are global and even all global grants are not necessarily this complex, but we as Rotarians are capable of so much. It starts with the honey, the money. So the challenge is out to the Rotarians of District 7600, their clubs, their Club Foundation Chairs, their Foundation Advocates, and to all champions of The Rotary Foundation to reach into their own pockets, to encourage others to do so, and donate to The Rotary Foundation. This will assist the clubs in meeting their 2015-16 Rotary Foundation giving goals and will help us all ‘Bee’ A Gift to the World. A Bit O’ Honey can go such a long way! 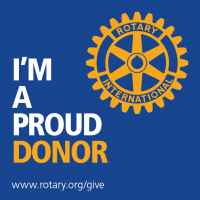 Are your clubs ready for Rotary Foundation Month? Before the lead topic which is Rotary Foundation Month, let’s pause to reflect on this week’s header. It features our District Foundation Committee Chair and Past District Governor, Jim Probsdorfer, addressing remarks to the standing-room-only global grants session at the District Conference. He wasn’t the only speaker. A delegation from the Innsbrook Club & Friends of Barnaby spoke of their partnership and multi-club project in Honduras, and Roma Frye of the Newport News Club described a recent three-bridge, Bridges to Prosperity project in Africa. It also was a partnership and multi-club project. These two projects included District 7600 clubs which were smaller than the lead clubs, but gave those clubs a chance to get skin in the game on large scale international projects. SuAnne Bryant is the go-to person for more information on global grants. Yesterday the Foundation Advocates received a resource packed email which originated with Liz Lazar, our Annual Giving Officer at The Rotary Foundation. She covers Zones 33 & 34 which happily includes District 7600. The email is reprinted here, November Foundation Month, and you are invited to refer to it as you encourage or arrange for your club(s) to participate and advocate in a major way for The Rotary Foundation during the month of November. Many of you are are Foundation Advocates, Area Governors, Club Foundation Chairs, or Foundation groupies, but whatever your role or interest please encourage your clubs to make the most of the resources (with links) provided by Liz. November 12 is the date of our Annual Foundation Awards Banquet in Williamsburg at the Colonial Heritage Country Club. Anne Matthews, Past Rotary International Vice-President will be our keynote speaker. It will be a packed two hour dinner and program during which many clubs from our district will be recognized for their commitment and accomplishments. Registration is open on www.dacdb.com. Get it on your calendar, register early, and bring your spouse and fellow club members. Make it a gala evening to remember. This shout out is for Boo Elmore of the Chester Club who is organizing the World Polio Day efforts of the district Interact and Rotaract Clubs which will host Purple Pinkie events on October 23rd & 24th. Find one and get your pinkie done!